Male Voice: Beware, Jessica. On the kiss’s beveled edge, time is a void. Avoid, avoid memory’s broken pledge. Female Voice: You’re wrong, sheriff. Your tale is noble and tragic like the mask of a tyrant. No drama so perilous or magnetic, no detail can make our love pathetic. What I’ve always wondered is whether these crazy lines, which sound like something out of a Shakespeare comedy, were in fact an accurate representation of Westbound‘s dialogue or just more Godard tomfoolery (i.e., did he create a fake Westbound soundtrack expressly for Breathless?). So I put on my Sherlock Holmes deerstalker cap and headed to my local video store to investigate . . . Westbound was released toward the tail end of Budd Boetticher’s richest period as a Hollywood director, but it has always been considered a minor effort and has been somewhat difficult to see. It was not, for instance, part of the lavish 2008 DVD box set devoted to Boetticher and Scott, which included more well known titles such as the aforementioned Tall T, Decision at Sundown (1957), Buchanan Rides Alone (1958), Ride Lonesome (1959) and Comanche Station (1960) — not to mention an excellent new documentary, Budd Boetticher: A Man Can Do That, featuring testimonial interviews with the likes of Clint Eastwood, Martin Scorsese and Quentin Tarantino (who named Michael Madsen’s Kill Bill character, Budd, after Boetticher). The omission, however, may have had more to due with the vagaries of rights issues than anything: Westbound was originally released between Buchanan Rides Alone and Ride Lonesome but it was made for Warner Brothers while the other films included in the DVD box set were all made for Columbia. The only other Boetticher/Scott western not in the box set was their first collaboration, the highly regarded Seven Men from Now, which was also made for Warner Brothers. But, while Seven Men from Now was released to much fanfare in a “widescreen special collector’s edition” DVD from Warner Home Video in 2005, Westbound has been relegated to the more obscure “Warner Archive Collection” (i.e., it is available for sale only as a lower-quality DVD-R through their “burn-on-demand” program). Fortunately, Facets Multimedia in Chicago rents titles from the Warner Archive Collection and I was able to discover that, in spite of its second-class status, Westbound remains a very enjoyable entry in the Boetticher/Scott cycle. The plot of the Civil War-set Westbound centers on Randolph Scott’s John Hayes, a Union Cavalry captain who is given the perilous task of overseeing a long-range shipment of government gold via stagecoach. Hayes runs into trouble when the stage stops in Julesburg, a Colorado town full of Confederate sympathizers — including his former nemesis Clay Putnam (Andrew Duggan), a land baron who stole Hayes’ girl, Norma (Virginia Mayo), years earlier. The screenplay for Westbound was not written by Burt Kennedy (who penned four of the Boetticher/Scott movies) and it therefore lacks the terse poetry that provides the best films in the series with their most memorable lines (i.e., “There are some things a man can’t ride around,” or “A man can do that.”). It was written instead by one Bernie Giler and based on a story by Giler and Albert S. Le Vino. The Westbound script does not, however, deviate so much from the typical Kennedy/Boetticher template that it attains the poetic flights of fancy that Godard would have us believe. As much as it would please me to hear Viriginia Mayo, a pin-up with gravity-defying breasts, say that “Time is a void,” there is simply no dialogue anywhere in the movie that remotely resembles the “beveled edge” nonsense that we hear in Godard’s film. 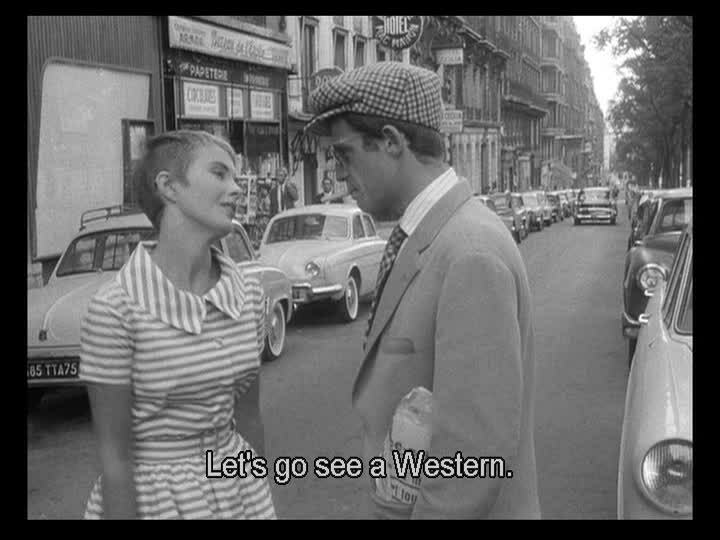 And yet every reference I’ve seen in books or academic essays alluding to the Westbound scene in Breathless assumes that the dialogue is genuine (with some critics even praising Godard for using an excerpt of dialogue from the Boetticher movie that seems to cleverly comment on the dilemma of Michel and Patricia!). There are several obvious clues, however, that Godard’s soundtrack is phony: first, there is no character named “Jessica” in Westbound. The only other female character aside from Norma is named Jeanie (Karen Steele). Then, there is the unlikely way that Godard’s poetic dialogue is spoken calmly in a sound mix that simultaneously features loud gunshots and a musical score of blaring horns, which seems to be Godard’s way of declaring “This is a western” rather than marking a serious attempt at recreating an authentic western soundtrack. Ann: No matter what I tell you, you don’t want to hear the truth. You won’t let me tell it. You think I’m lying! Dr. Sutton: Does this cheap parasite mean so much to you that you’re willing to risk everything to cover up for him? 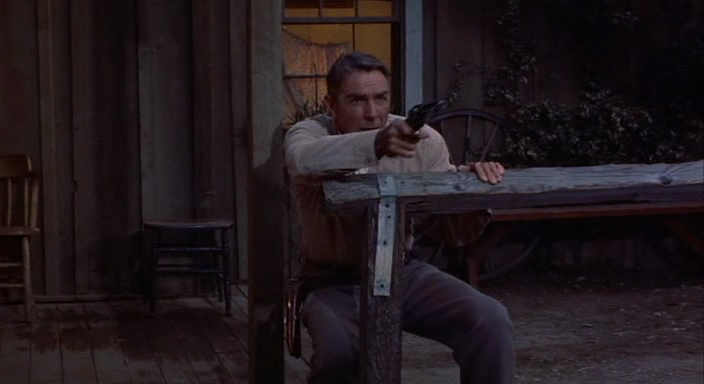 In the 1950s Budd Boetticher was one of those Hollywood directors, along with John Ford and Anthony Mann, who helped to usher in a new era of “adult westerns” that featured more neurotic protagonists (Jimmy Stewart actually cries at the end of Mann’s masterpiece The Naked Spur) and dealt more explicitly with the genre’s darker themes of racism, colonialism and disillusionment (e.g., Ford’s The Searchers) than what had been possible in prewar Hollywood. In the 1960s Godard and his compatriots in the New Wave, as well as “art film” directors from other European countries, would usher in a new era of self-reflexivity and modernism that would break down the illusion of Hollywood’s “invisible” storytelling altogether. And yet, for one brief moment, on the beveled edge between these eras and continents, it was still happily possible for Jean-Luc Godard’s youthful and rebellious characters to attend — and appreciate — a new western by a Hollywood master like Boetticher. 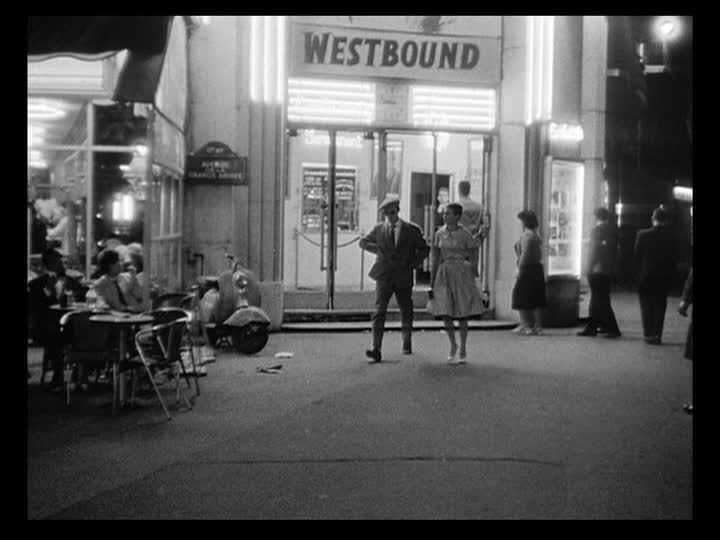 This entry was posted on Monday, September 2nd, 2013 at 9:45 am	and tagged with A bout de souffle, Breathless, Budd Boetticher, Burt Kennedy, Jean-Luc Godard, Otto Preminger, Westbound, Whirlpool and posted in Essays. You can follow any responses to this entry through the RSS 2.0 feed. I remember when I first met you and you made me watch this film, and I loved the lead actress’s hair so much that I cut it that way as soon as I got home from my honeymoon! You’re more beautiful than Jean Seberg — with short or long hair. Hmm, I suspect I’ll want to check this film out. I have that Boetticher box set and much pleasure it has brought me too. I just re-watched À bout de souffle again recently, and hadn’t even considered the lines quoted might have actually come from the original film, though it makes me imagine an alternate reality where 1950s B-movie westerns were dubbed into French by a bunch of alienated philosophy students. Ha! Yeah, I was always 98% sure that those lines were not from WESTBOUND but I had to finally see it just to make sure. Though the possibility of alienated philosophy students dubbing B-westerns into French doesn’t sound all that farfetched . . . Thanks, John. It’s a real honor to be compared to Rosenbaum in any kind of way. He’s one of my favorite critics and I’ve read almost everything he’s ever published. Hi Michael! Nice piece. You didn’t quite get to solving the mystery of the attribution of those poetic lines, but I figured it all out back in 2003, and my detective work appears in a chapter of the book FOREVER GODARD. Basically, yes, they are dubbed by Godard; the text comprises citations from two distinct poems, respectively Louis Aragon’s “Elsa je t’aime” (“Elsa, I Love You”, one of many lyrical poems composed in honour of his wife) and “Cors de Chasse” (“Hunting Horns”) from Guillaume Apollinaire’s Alcools. Before each of these citations, Godard has invented a ‘cowboy’-type line to make the exchange of verses seem, comically, like a dialogue from Boetticher’s Western. Godard himself provides the male voice here! And the Aragon poem is one he is still quoting in his latest, Cannes-winning FAREWELL TO LANGUAGE, even on its poster. Thanks a million for the clarification, Adrian! I will make it a point to read FOREVER GODARD and I will also add a postscript to this piece alerting readers to the fact that the “answer” to this mystery can be found in your comment below.